When I came across the uglier version of my drop down menu then I decided to style it using CSS and share it with you all. 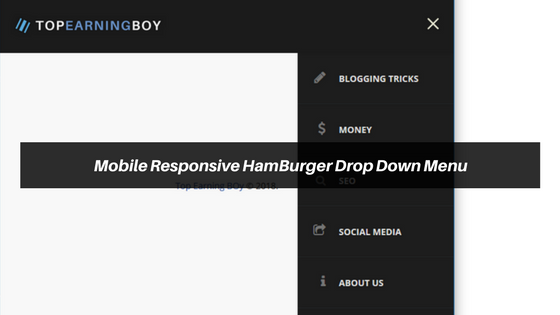 In this post you will learn to create mobile responsive hamburger drop down menu for blogger. Before I come up to the coding part, let me tell you the features of this amazing and responsive hamburger drop down menu. For live demo, reduce the size of browser. As this particular HamBurger drop down menu will appear only in mobile version of your template so just surround your desktop menu with isMobileRequest conditional tags. In this way your desktop menu will appear only in desktop devices and this particular menu will appear only in mobile devices. Now Search for <body> tag and just below it paste the following code. Replace TopEarningBoy with your own blog title and https://www.topearningboy.com with your blog URL. Logo Url with your blog logo URL, hash sign # with your page URL and Link Text with your page title. Search for </head> and just above it paste the following CSS code. Replace #1b1b1b and background:#444 with your background color and tab hover color respectively. All credits goes to Kevin Powell because through his code that you can find on codepen I was able to share this exciting but tricky tutorial with all of you. Hope it was helpful and you liked it. Thank you all and don't forget to subscribe my blog. Need any kind of help, just comment in the section below!